Dr. Dowiatt has been offering his patients Invisalign for many years, and he is one of Invisalign's Preferred Providers. Invisalign is the virtually invisible way to straighten your teeth without braces, metal wires, or brackets. 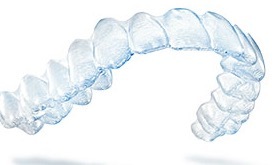 The Invisalign treatment consists of a series of clear plastic aligners, created precisely to gently and gradually move your teeth into p lace. By using a series of clear removable aligners, Invisalign straightens your teeth right before your eyes. Change them about every two weeks, and your teeth will move - little by little, week by week - until they have moved to the final position that Dr. Dowiatt has prescribed for you. Using advanced 3-D Technology, we can predetermine your treatment plan, and show you the results you would achieve, even before you start your treatment. Call our office to learn more about Invisalign. Dental services provided by Dr. Dowiatt: Click on links in box to learn more about each service.